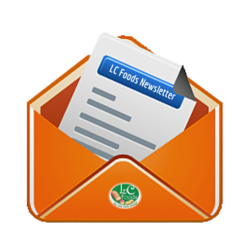 Welcome to the LC Foods Newsletter Archives! Click on the links below to view past newsletters. 1/5/2019- New Low Carb Bagels! 11/27/2017- Cyber Monday Deals 2017! 11/20/2017- Black Friday Deals 2017! 11/02/2017- Low Carb Thanksgiving 2017! 07/23/2017- Low Carb Ice Cream Sundaes! 03/09/2017- Introducing Fresh Baked Subscriptions! 01/04/2017- Rescue your New Years Resolution! 11/21/2016- New & Improved Decadent Dark Chocolate Bars! 09/24/2016- Win your Favorite LC Foods Product! 09/14/2016- Chocolate Chip Banana Bread! 08/30/2016- Cheesy Bacon Angel Biscuits! 08/01/2016- Where do you Snack Pack? 05/26/2016- New Dark Chocolate Snack Packs! 04/21/2016- Dark Chocolate Nut Spreads! 01/04/2016- Diet & Weight Management Sale! 12/18/2015- New Gluten Free Bread! 10/07/2015- New Fresh Baked Products! 08/16/2015- Low Carb Waffles & Biscuits! 05/17/2015 – Memorial Day Sale! 04/08/2015 – New Fresh Baked Products from LC Foods! 03/16/15 – Get Your Free Bag of Fresh Baked Granola! 03/04/15 – Meet Us at the ADA in New York! 02/04/15 – $1 Super Sale, Chocolate Month + New Products Preview! 12/31/2014 – Encouragement for Your New Year’s Resolutions! 12/26/2014 – We Want to Hear Your Story! 12/19/2014 – Enter to Win $100 to LC Foods! 12/12/2014 – Happy Holidays + Your Free Gift Inside! 11/26/2014 – Black Friday Sale! The More You Spend, The More You Save! 11/11/2014 – 20% off Your Low Carb Thanksgiving! 10/29/2014 – More Books added at Unbeatable Prices! 10/16/2014 – Save on Books from LC Foods! 09/26/2014 – Dinner Rolls! Fresh Baked & Low Carb! 09/18/2014 – Celebrating the New LC Foods Market! 08/11/2014 – New Fresh Baked Pizza Shells, New Barberries & More! 08/02/2014 – Fresh Baked, Low Carb Pizza Shells! 07/31/2014 – Summer Savings – 10% Off Coupon Code! 06/06/2014 – I Scream, You Scream, We All Scream for Low Carb Ice Cream! 04/21/2014 – Fresh Baked Low Carb Multigrain Bread! 03/17/2014 – New LC Fresh Baked Bread – Reserve Your Loaf!